All of us have great demands on our time. Today we're going to talk about scheduling our days. I think scheduling consists of two parts: keeping track of our outside commitments and giving order to our normal day. Until I had a bunch of kids, I was able to remember and keep track of all the things I needed to do. At some point, either because of those kids or just aging in general, things began to fall through the cracks. 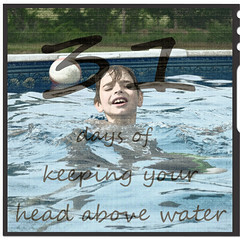 In order to keep your head above water, you need to get those things out of your brain and down as a hard copy. The way I do this is to have a centralized calendar. If you want to be creative, just do a search on pinterest for calendars! If you want to be tech savvy, then you can use google calendar or ical and sync up with every member of the family. I just use a regular old wall calendar. When something comes in the mail or we make an appointment, I add it on the calendar. My calendar hangs on the kitchen wall, so it is easy to glance at it and see what we need to do. I think it is also important to give structure to our days. Those of you that work outside the home or send your kids to school, those schedules will dictate a large part of your day. Those of us who stay home and/or homeschool may need a schedule to help keep us accountable for how we use our days. All of us can use a routine for the morning and evenings. I find that having a 'schedule' to follow helps me organize my day and feel less harried. It can help me to get in all the many things I need to do each day. How do I make my schedule? First, I list out all the things I need to do in a day and how long it takes to accomplish those tasks. I try to add in everything, from sleep to exercise. Then, do the math by adding up all the times. If you're below 24 hours then you are ready to make your schedule. If you are over 24 hours, then you have some decisions to make. Because, contrary to the belief of everyone putting demands on our time, there are only 24 hours in a day! Something has to go. You have to make decisions about what are necessities in each day. Once you have your day down to 24 hours, write a plan for your day. This doesn't have to be an exact plan, but something to guide your time as you go about your day. You probably need a few points during your day that are pretty set ... wake up times, meal times, bed times, etc. Then, you can fill in the things you need to do in between allowing enough time for each one. You may need to be creative with your day to fit everything in. As with everything in life, you need to use your schedule as a tool and not allow your schedule to rule you. Some days the schedule gets thrown out the window. Other days something on the schedule will take exceptionally long and you will have to choose something else that you can forgo. These are the days that quick go to meals may save you that extra time you need. Occasionally, there are days where everything goes just as you planned, but those are rare! Just knowing what you should be doing next is helpful for me.